Jump at the opportunity to stay in the private Bear Foot Mountain Resort Owners personal cabin loaded with upgrades and amenities. Enjoy incredible 180 degree mountain views from your 2 private decks. 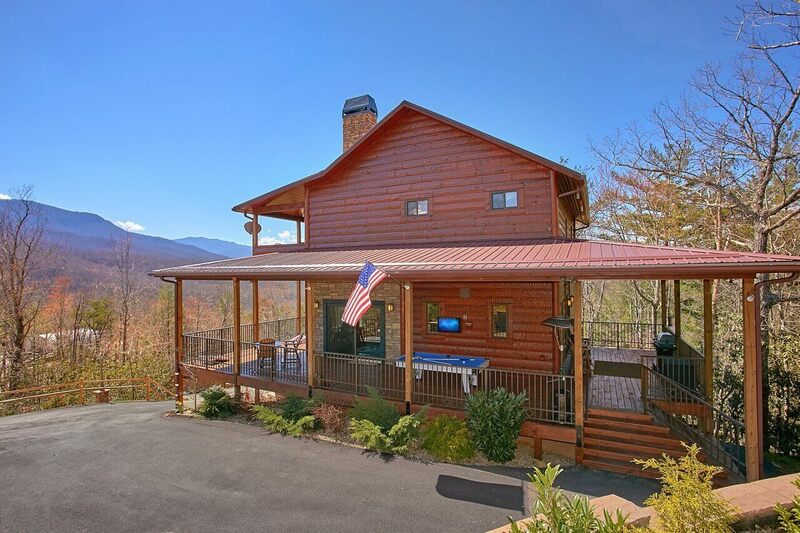 Located near Cobbly Nobb conveniently off highway 321 you are just 15 minutes to downtown Gatlinburg and 8 Minutes to the Greenbrier entrance to the National Park. 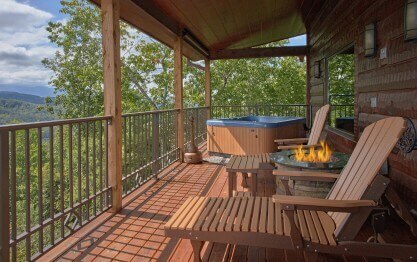 Enjoy your vacation with your special someone in your own private luxury cabin with 180 degree views of the mountains. You will enjoy the large gourmet kitchen with commercial grade appliances, luxury master suite with fireplace and spa style bathroom with shower jets and Jacuzzi tub, 2 covered decks with outdoor lounge chairs and porch swing, a game area in the loft with table top arcade. Enjoy views from the great room while relaxing in front of the fireplace. Watch a game on the 70 inch TV with DirecTV satellite. 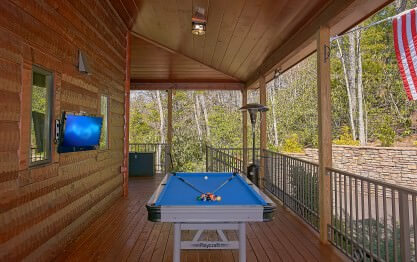 Enjoy the outdoors with your outdoor covered play area including a pool table and corn hole. 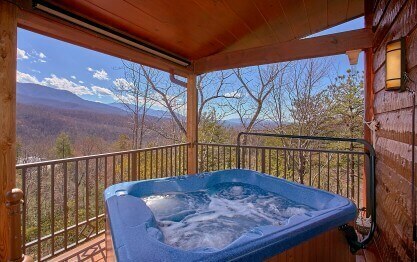 End your day relaxing in you 102 degree hot tub with mountain views! 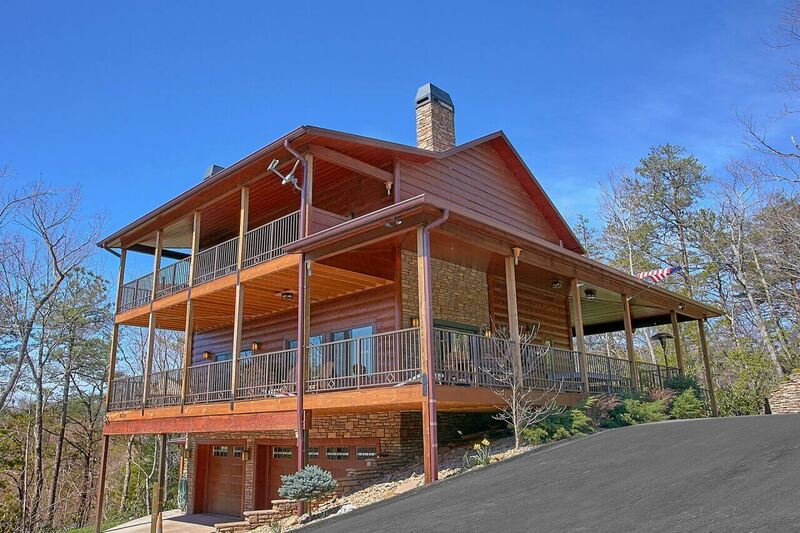 *** This Property is located 10 minutes from Elk Springs Resort! Livin It Up was simply perfection. Everything from the amenities to the views of the mountains were second to none. Exceptionally clean and comfortable. We are delighted to hear that your recent stay at Livin' It Up not only met but exceeded your expectations, Mitzi. We certainly agree! This cabin is beautiful and the view is truly hard to beat. 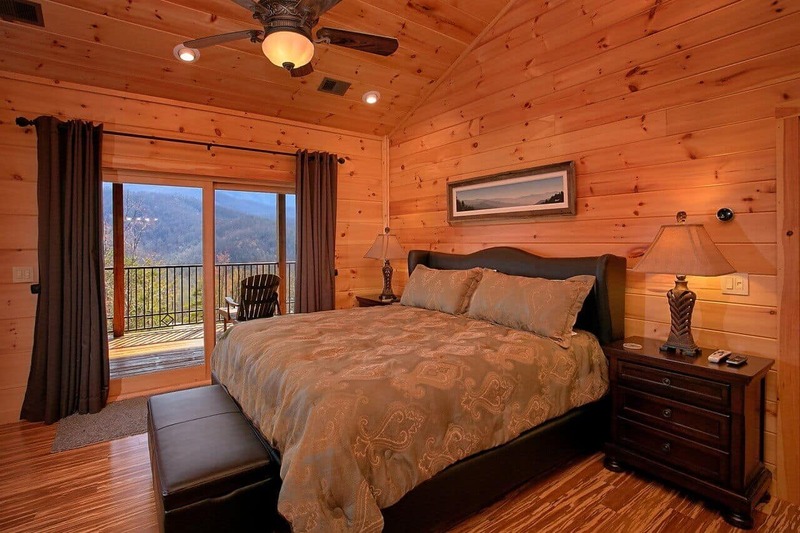 We hope you found your home away from home when visiting The Smokies. Remember, as a repeat visitor you will save 10% on all future stays. Hurry back, a new adventure awaits. My wife and I enjoyed this cabin. It was cozy and had so many amenities in it. We loved that it was in the mountains and had a view of the mountains. We liked the jacuzzi and kitchen. It was spacious as well. You will like staying here! We are overjoyed to hear that you and our wife had such a great stay at Livin It Up! You certainly chose a great cabin for your anniversary. It is a wonderful place to relax in and enjoy some time away from the hustle and bustle of everyday life. The location is great too! 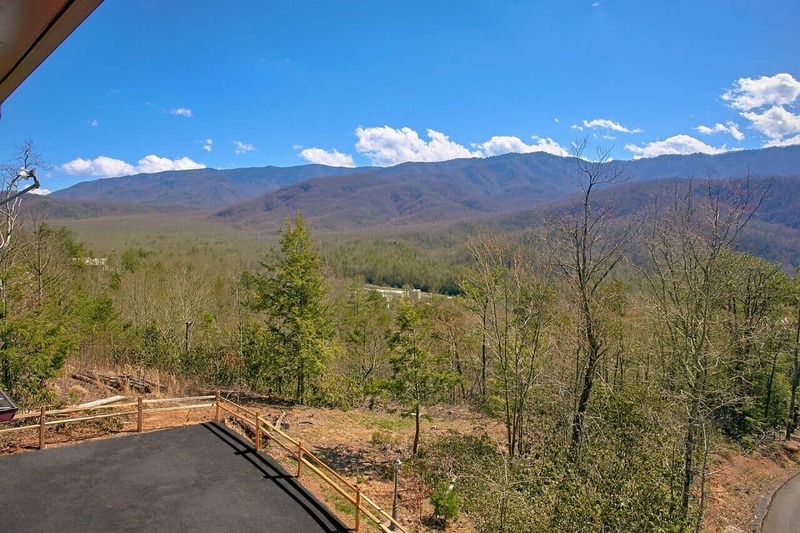 As you mentioned, you get the real mountain feeling here and a fantastic view, but also you are only a short drive to many popular attractions and The Great Smoky Mountains National Park. We hope to become your home away from home while in the area. We encourage guests to book direct and save up to 15% on your booking. Hurry back, new memories are waiting to be made! The cabin was absolutely beautiful! The most amazing views. The cabin lived up to its name, Livin’ it Up! From the very detailed notes placed around the cabin, to beautifully designed layout, i…t was the BEST trip we’ve ever been on. Definitely will be going back, and we can not wait!!! Thank you for your wonderful review, Antriea! We are delighted to hear you enjoyed your stay. 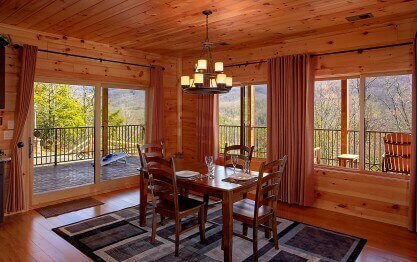 You certainly chose the perfect cabin for a memorable get-away. We enjoyed having you as our guest and would consider it an honor for you to stay with us again. We encourage guests to book direct and save up to 15% on your booking. We had the best time in this stunning cabin. Everything from the views, to the amazing chefs kitchen. We did not leave the cabin to explore. This cabin was not a disappointment. The pictures also do not do it justice. We appreciate your fantastic 5-star review, Kenneth. We certainly agree! Livin It Up is a beautiful cabin with top-notch amenities that are sure to make for an unforgettable experience in the mountains. We enjoyed having you as our guests, and we hope you will choose to visit with us again very soon. Remember, as a repeat visitor you will save 10% on future stays. Thank you! This place is ABSOLUTELY BEAUTIFUL!!!! My husband and I stayed here on our honeymoon and we definitely will be back next year!! It was so relaxing on top of the mountain. It was secluded and we absolutely enjoyed ourselves! Thank you for allowing us to be a part of such a special celebration, Kassi. Congratulations! It was certainly our pleasure to provide you with luxury accommodations for your honeymoon, and we hope to become part of your anniversary plans for years to come. 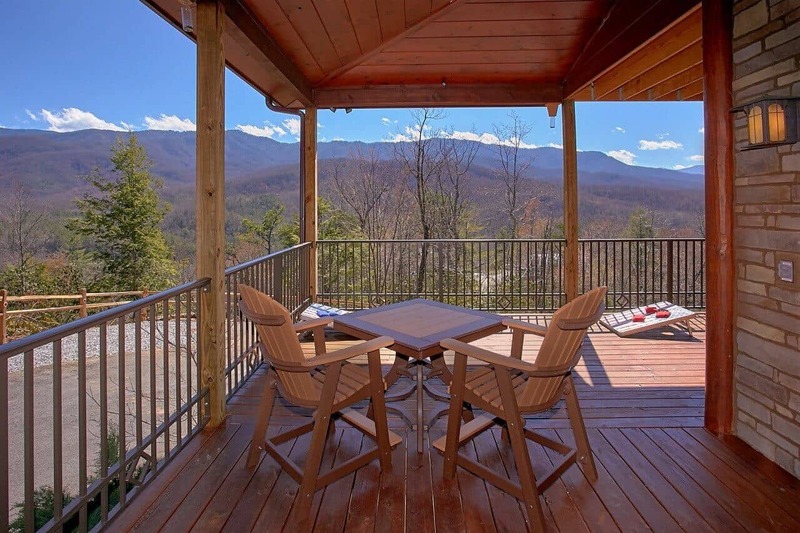 Livin' It Up is truly a beautiful cabin, and the location is perfect for enjoying the peaceful mountain scenery or hitting downtown Gatlinburg and Pigeon Forge. Don't forget to mention you are a repeat visitor to receive 10% off your next booking. Hurry back, new memories are waiting to be made! "Living It Up Stay was Wonderful"
The cabin was really amazing. The views were fantastic. The kitchen was fully equipped with everything you needed to cook. Our stay was very relaxing and we enjoyed the cabin and the scenery. Hope to come back one day. Thank you for your wonderful review, Andrea! We are excited to hear your stay was exceptional. We enjoyed having you as our guest and would consider it an honor for you to stay with us again. Please keep in mind, as a returning guest you will enjoy 10% off all future stays. Hurry back, your next adventure awaits! We are from South Louisiana & stayed here for our honeymoon. It was INCREDIBLE!!! The views are to die for & the fireplaces are amazing! We played pool outside while grilling steaks & soaked in the vi…ews. The cabin was so clean when we got there. Once we found the cabin it was super easy to get to the rest of the stay. Everything is top quality & we want to go back! The fire pit outside was a little tough to get to but we made it work. Highly recommend!!! Thank you for allowing us to be a part of such a memorable occasion, Adrienne! Congratulations! You certainly chose the perfect location to get away from the hustle and bustle of life and enjoy a romantic get-away that you are not soon to forget. We enjoyed having you as our guest and hope you will consider making Elk Springs Resort part of your anniversary plans for many years to come! 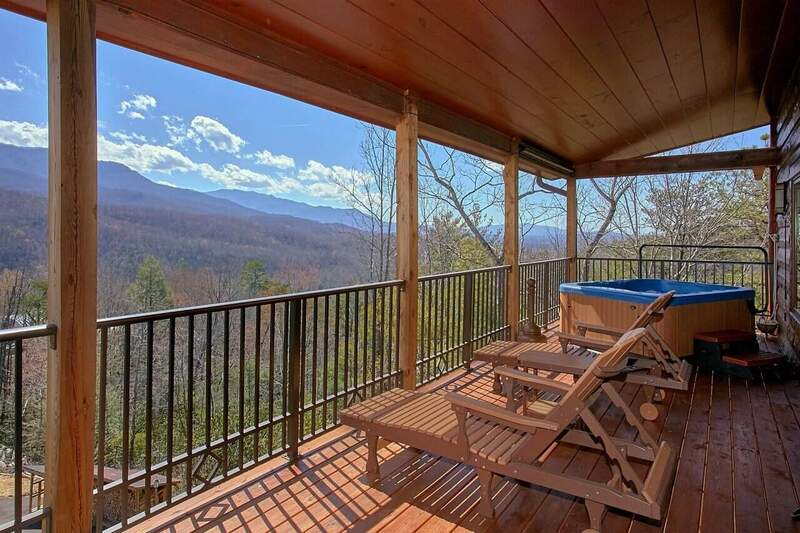 This vacation rental was everything and more that was given in the description. My husband and I were totally amazed at the decor, cleanliness, layout, appliances, etc. This place is luxurious and well deserving of LIVIN IT UP! As always, we love hearing from another satisfied customer! 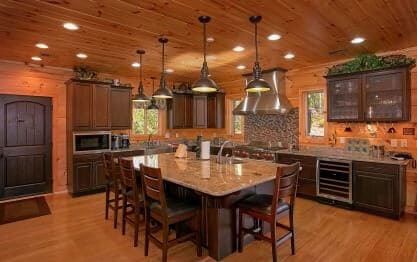 Livin' It Up is truly a fantastic cabin that is perfect for enjoying some time away from the hustle and bustle of everyday life. It truly is a hidden gem! We hope you and your husband will make plans to visit with us again soon. Please keep in mind, as repeat visitors you will enjoy 10% off all future bookings! The was the best place to spend our honeymoon! 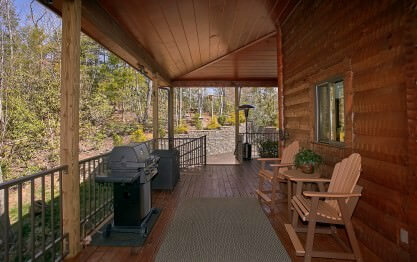 Amazing cabin that is secluded, and has all the amenities. They have forgot nothing, and we were very impressed. Also, within 20 minutes from Gatlinburg. Thank you for allowing us to be a part of such a memorable occasion, Mark! Congratulations! We enjoyed having you as our guest and hope you will consider making Elk Springs Resort part of your anniversary plans for many years to come. Please keep in mind, as a returning guest you will enjoy 10% off all future stays. Hurry back, new memories are waiting to be made! This cabin was beautiful, the views are amazing and it was so much nicer than we even expected. Thank you for your wonderful 5-Star review, Julie! We are delighted to hear we exceeded your expectations. We enjoyed having you as our guest and hope you will consider staying with us again in the future! We appreciate your business and your wonderful 5-star review, Georgeta! It is great to hear that you enjoyed your recent stay at Livin It Up. You certainly chose a great cabin to relax and enjoy some time away from the hustle and bustle of everyday life. We look forward to your next visit with us and don't forget to mention you are a repeat visitor to enjoy 10% off all future bookings. Hurry back, new memories are waiting to be made! We loved everything about this cabin. The owners thought of everything. It?s very clean. It has fully stocked kitchen, towels, bed is fully made and spotless and comfortable. 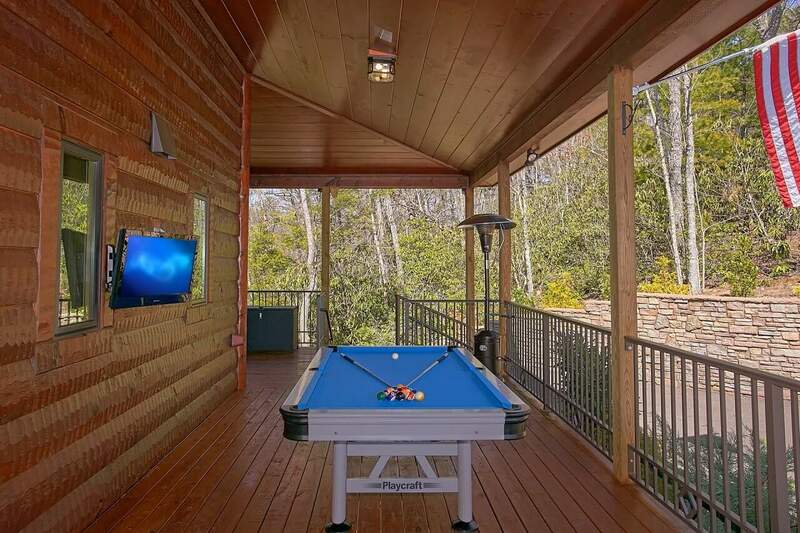 Cabin has a pool table…, corn hole, Pacman. The views are spectacular! Watching the stars from the hot tub was so relaxing. Everything is new and updated. The kitchen is amazing, beautiful granite huge island. The stove is top of the line, and the refrigerator also. Wine fridge, microwave, coffee maker, dishwasher, pantry, all new. My son is an executive chef and this is definitely a kitchen he would love, a chefs kitchen for sure. We can?t say enough about this cabin...you just have to see it. You won?t want to leave, it?s just that perfect. We will return to this cabin. We danced outside playing pool and then danced again on top deck watching the stars. (My husband never dances) Oh yes two decks. We needed a place to relax and de stress and Livin It Up gave us that. Directions were great. Elks Springs Resort office personnel were so helpful and they went out of their way to help us have a great vacation in Tennessee! I can?t wait to come back next year. If you are looking for a cabin but really are worried about finding the perfect place then look no further....stay here you won?t be disappointed. I give this 5 stars but would give it a 100 stars....love, love, love this cabin. 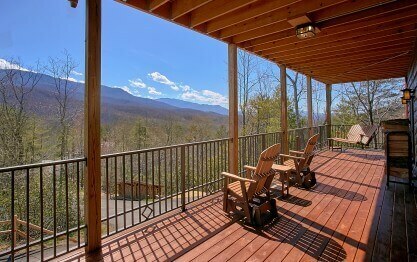 Easy access to the main road to go shopping and to Dollywood and National Park. Forgot about the bathrooms, they are spotless and huge. 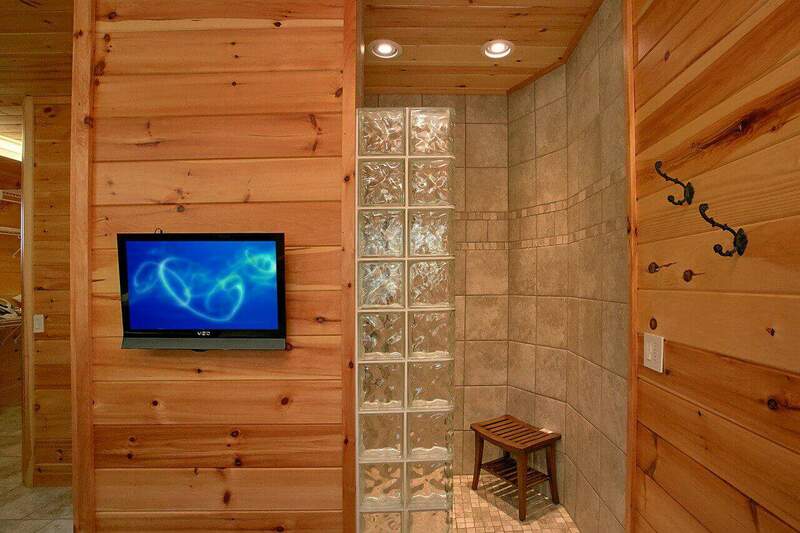 Tv by jacuzzi, 3 or 4 shower heads, a rain shower and side jets. It?s such a pretty set up. You can tell the owners love their cabin, it shows, it?s well taken care of. Cleaning staff do a wonderful job. Again talk to the staff at Elk Sorings resort because they are very helpful, and are happy to help you. We love Tennessee and Elk Springs Resort???????????? Thank you for our fantastic 5-star review, Karen! It sounds like you chose the perfect cabin to relax and truly escape from the madness of everyday life. We certainly agree! This cabin couldn't be more perfect; the views are fantastic, the location is perfect, and the amenities are top-notch. We take pride in our cabins and it is great to hear that we not only met but exceeded your expectations. It would be a pleasure to serve you again in the near future. Don't forget to mention at the time of your next booking that you are a repeat visitors to receive 10% off. Hurry back, new memories are waiting to be made! "Weekend Getaway WITHOUT KIDDOS "
To say this cabin was perfect, still wouldn't be describing it and its beauty well enough. The long driveway makes you feel like your headed to your own secluded fairytale castle. 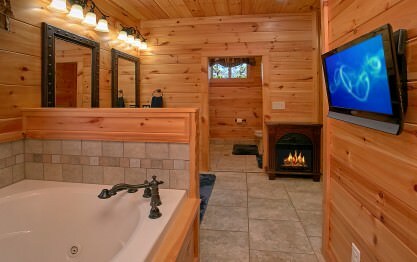 The shower is amazin…g, the view outside is phenomenal, and the TVs located outside on the deck and in the bathroom are a nice touch. Also really loved the outdoor gas fireplace. Definitely by far a favorite place and cabin!! Will be back! Thank you for your wonderful review, Carter! We are delighted to hear you enjoyed your stay at Livin It Up. This is the perfect cabin to relax and recharge! We enjoyed having you as our guest and would consider it an honor for you to stay with us again. Hurry back, new memories are waiting to be made! Thank you for your kind review, Mitchell. We are pleased that you enjoyed your recent cabin stay, and we hope you will make plans to visit us again soon. "Wonderful place to stay. " Great clean place to stay. Very peaceful. Very comfortable bed. Thank you for your wonderful 5-Star review, Jonathan! We are delighted to hear your stay was exceptional. We enjoyed having you as our guest and hope you will consider staying with us again during your next visit to Gatlinburg. Thank you for your wonderful review, Brenda! We are happy you enjoyed your stay. 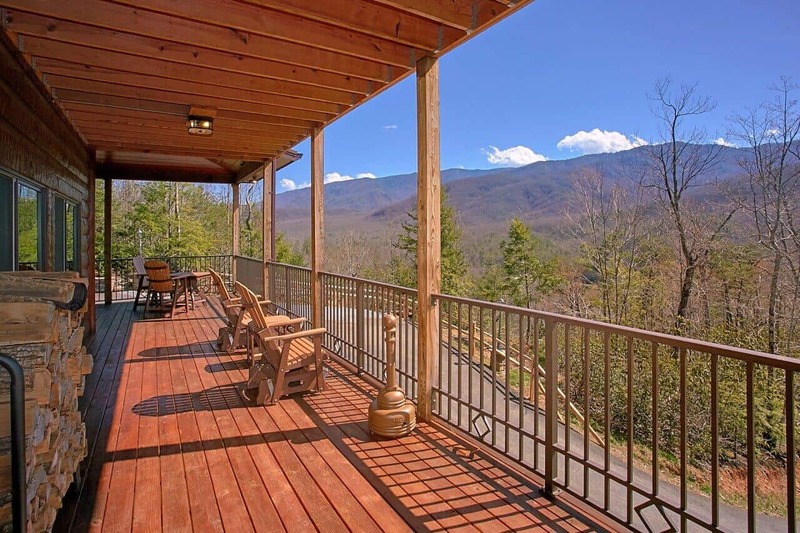 We hope you will consider staying with us again during your next visit to The Great Smoky Mountains! Amazing kitchen, secluded and great views, clean with everything needed - not your average rental. About 15-20 minutes from everything so if you like to be close to town, it?s a bit of a drive but didn?t bother us. Thank you for your fantastic review, Jaime. We are delighted that you enjoyed your recent visit; Livin It Up is definitely a fantastic cabin and is perfect for a private getaway. We hope you will make plans to visit again very soon! Please keep in mind, as repeat visitors you will enjoy 10% off all future bookings. I loved the cabin! Everything was perfect! The maintenance person was fast to respond to changing out the tank for the firepit. The view was amazing and so was the privacy. Hopefully we will be able to return soon! 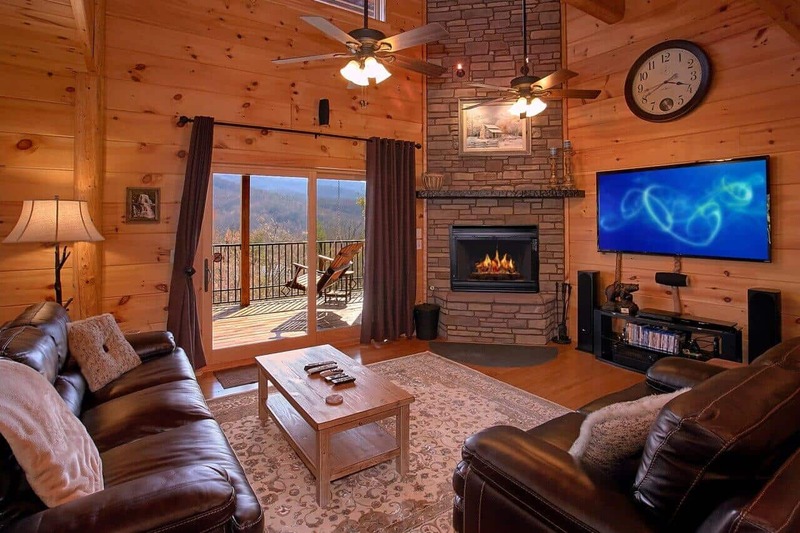 We certainly agree, Livin' It Up is a great cabin to relax and simply enjoy the mountain area. Customer care is very important to us, so we are very happy to hear our maintenance technician was prompt to address the empty propane tank. We hope you will get to visit our area again very soon. We stayed in Livin' It Up for our honeymoon & it was gorgeous. Cabin was very clean, secluded & exactly as described & pictured. We couldn't have chose a better place for our honeymoon. It was perfect…! We will definitely be looking to rent from Elk Springs Resort for future vacations! Thank you for allowing us to be a part of such a special celebration, Breanna. Congratulations! We hope to become part of your anniversary plans for years to come. Please keep in mind, as repeat customers you will enjoy 10% off all future bookings. Hurry back, new memories are waiting to be made! We have had some bad experiences in Gatlinburg before so I was a little gun-shy to spend our 15th wedding anniversary there. I did a lot of research and found Elk Springs and their "Livin it up" cabin…. I could not say enough good things about this cabin. All the details were well thought out. Tons of amenities and everything was explained properly. 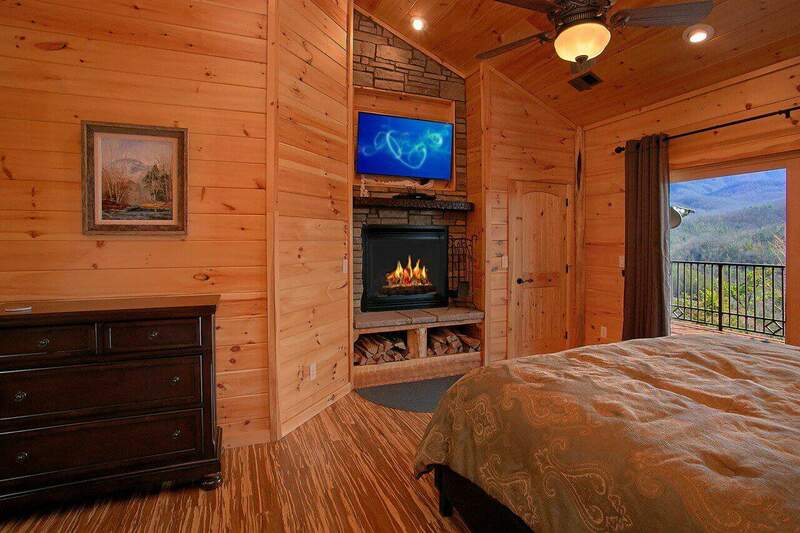 This is a top-notch cabin and you pay for it but it's what you would expect when paying that much for a luxury cabin. 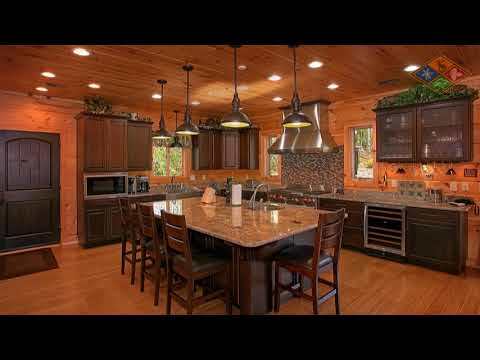 You will not find a better kitchen and the mountain views were majestic. We had an amazing anniversary there thanks to Elks Springs. 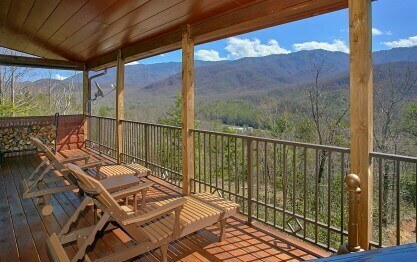 We would have a hard time staying anywhere else on our next trip down to Gatlinburg. Thank you for allowing us to be a part of such a wonderful celebration, Michael! Congratulations! We are delighted that you enjoyed your cabin stay! 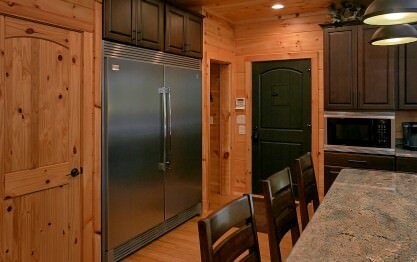 You certainly chose a great cabin to relax and create some lasting memories together. 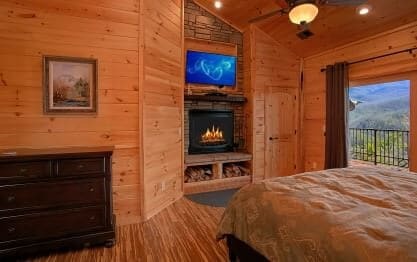 Livin' It Up definitely has a wonderful cozy feel and the fantastic wood burning fireplace makes for a relaxing stay during the winter months. We hope that you will make plans to visit again very soon. Hurry back, new memories are waiting to be made! "Honeymoon of our dreams "
At first we had a difficult time finding the cabin, due to it getting dark and the lack of cell service in the mountains. Once we found the cabin and pulled in it was everything we hoped it would be a…nd more. The pictures just don?t do it justice! 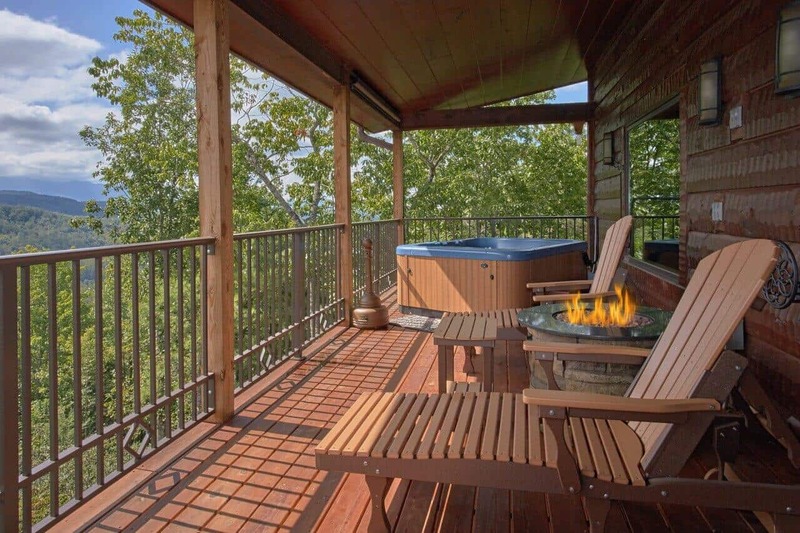 The kitchen and hot tub were probably our favorite parts of the house, along with the stunning Mountain View?s from every balcony! We will definitely be returning to livin? it up, and renting from Elk Springs Resort again soon! Thank you for allowing us to be a part of such a special celebration, Matthew! Congratulations! We are sorry you had a difficult time finding the cabin. Cell phone reception can be spotty in some areas here. We try our best to equip our guests with the best routes prior to arrival by sending the directions to the cabin in each of the confirmation emails. We sincerely apologize for any inconvenience this may have caused and hope you will consider making Elk Springs Resort part of your future anniversary plans. The cabin's space was clean, comfortable and the design and decor were planned perfectly. 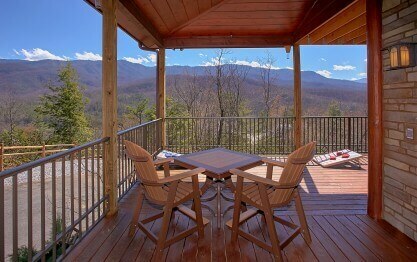 We enjoyed the deck and it's awesome view of the Smoky mountains. We enjoyed playing corn hole, pool, G…alaga, Pac Man, grilling out and of course the hot tub after a day of zip-lining. This place was just what we were looking for and it delivered. It was great to be nowhere but there. We recommend you consider staying here. Thank you for your fantastic review, Ron. We are delighted that you enjoyed your cabin stay! 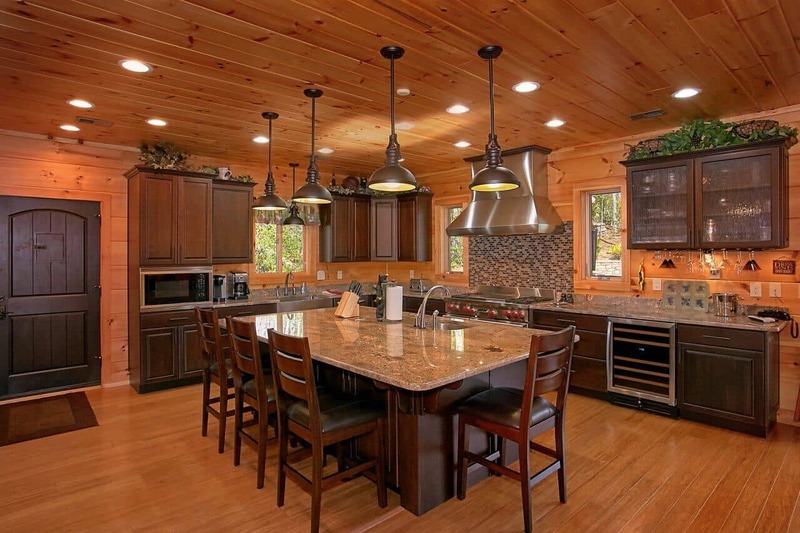 Livin It Up is definitely a great cabin to relax, enjoy top-notch amenities and create lasting memories together. We hope you will make plans to visit again soon and we appreciate the recommendation. Hurry back, new adventure awaits! Looking forward to returning to another Elks Springs Resort cabin next year. Thank you for your review, Donald. We look forward to your next visit with us. Please keep in mind, as repeat customers you will enjoy 10% off all future bookings! 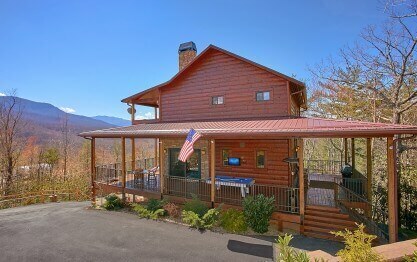 Great cabin rental located about 15minutes from Gatlinburg. Secluded but yet right off the main road. Beautiful views and the cabin itself was amazing. We had a great time and would recommend to anyone. Thank you for your amazing 5 star review, Eric. We are pleased that you enjoyed your cabin stay! 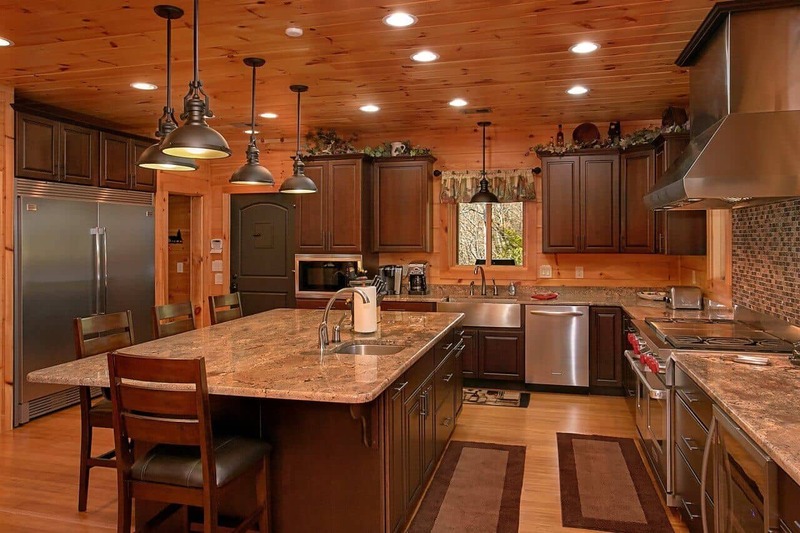 Livin' It Up is definitely a wonderful cabin to relax and create lasting memories together. We certainly hope you will join us again very soon and we appreciate all recommendations. Remember, as returning customers you will enjoy 10% off all future bookings! "Best cabin on the property!" We loved Livin it up! We have stayed at many cabins on this property and this was by far our favorite thus far!! Extremely secluded and at the very top of the property. Best view you can get on this p…roperty. 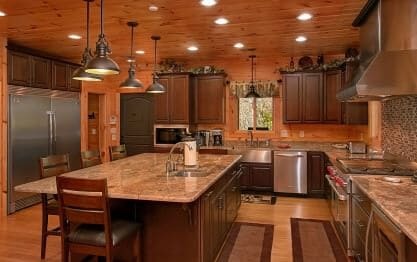 Cabin is absolutely amazing and the kitchen was the spotlight feature for us! Thank you for taking the time to share your wonderful experience with us, Jesse. We love to receive feedback such as yours! We enjoyed having you as a guest and hope you will visit us again soon. Please keep in mind, as a returning guest you will enjoy 10% off all future stays. Hurry back, new memories are waiting to be made! Coming from the midwest, being able to enjoy the views from this property was just amazing. 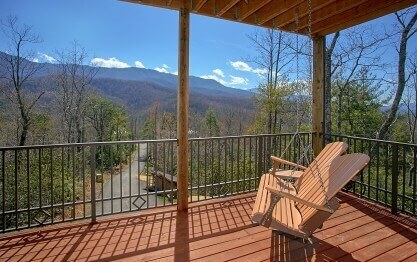 I could have sat on the porch swing all day just gazing at the mountains. And the amenities in the cabin w…ere just beyond. Loved the kitchen and master bedroom and bath. We would love to stay here again! We appreciate your amazing review, Lynda. As always, it is wonderful to hear from another satisfied customer. We are delighted that you enjoyed your stay at Livin' It Up and were able to take in the beautiful scenery. 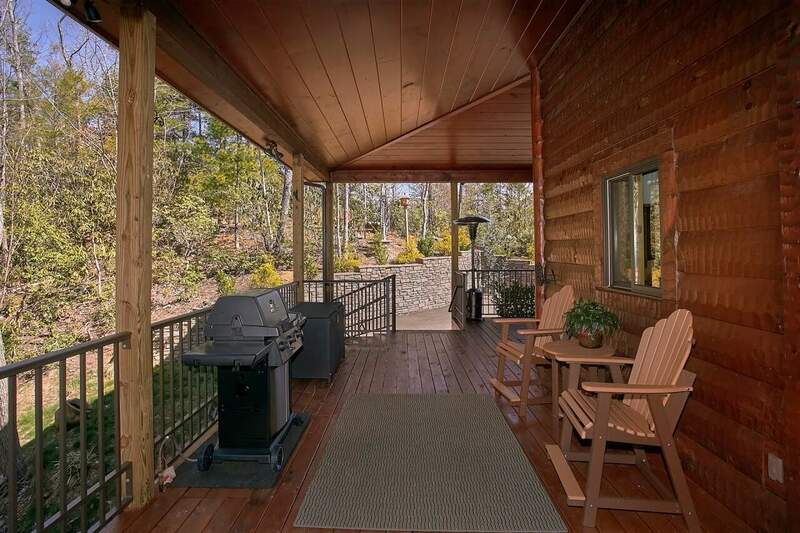 This cabin is in a great location and has some top-notch amenities for everyone to enjoy. We hope to become your home away from home while visiting the area. Hurry back, new adventure awaits! Everything promised and more. Will definitely return! Thank you for your wonderful 5 star review, Josh! We are pleased that you enjoyed your stay at Livin' It Up. We look forward to your next visit and keep in mind you will enjoy 10% off all future bookings for being a repeat guest. Hurry back, new adventure awaits! 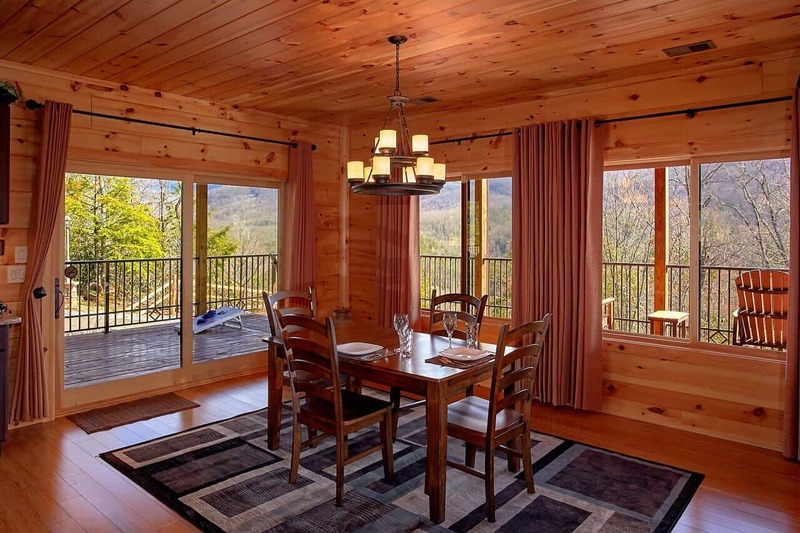 Absolutely breathtaking views, beautiful cabin from inside and out. Very clean, organized area. Very private with such homie touches. We didn't want to leave, but we will definitely be back!!! Everything and more!!! Thank you for allowing us to be a part of such a special celebration, Ashley! Congratulations! We are delighted that you enjoyed your cabin stay and hope to become a part of your anniversary plans for years to come. Livin It Up is a great cabin to relax and create lasting memories together. Keep in mind, as repeat guests you will enjoy 10% off all future bookings. Hurry back, new memories are waiting to be made! "Fantastic View and excellent place"
Well like the title says, fantastic view and excellent place to spend a few night with some one. Very spaciest and very comfy. Every thing was cleaned as one would expect. Will be doing more family tr…ip and wish i can stay here but just not enough rooms. But wont stop me from using Elk Springs Resort other rentals. Also did i mention that it very secluded. Just what i wanted. Thank you for your kind review, Scott! We are delighted to hear you had an exceptional stay. 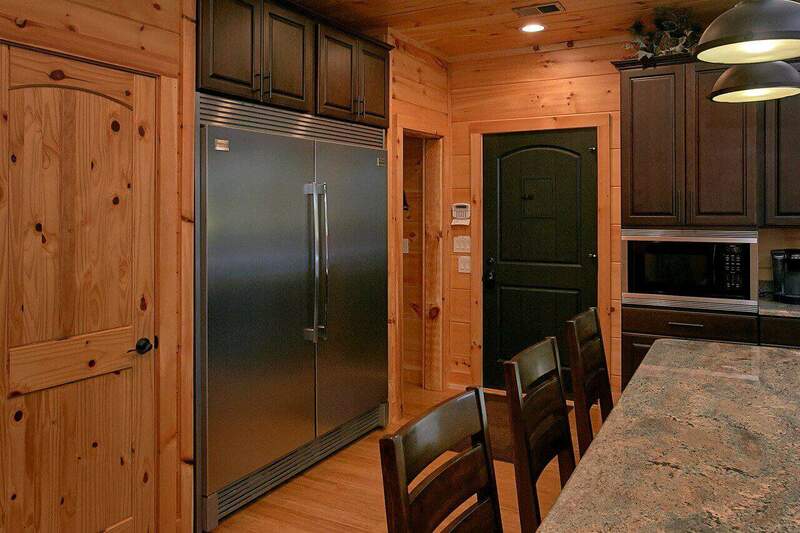 We offer a great selection of larger cabins that offer the seclusion you are looking for. Please contact us when you are ready to start planning your next get-away. One of our experienced Sales Representatives will be happy to assist you in finding the perfect cabin that will not only meet, but exceed, your expectations. We enjoyed having you as our guest and hope you will make plans to visit again soon! "Livin It Up was spectacular!" My husband and I stayed in Livin It Up for weekend getaway and a chance to relax. It was perfect for us and a wonderful experience. The cabin was amazing. It was clean, everything was in great shap…e and it had everything you could want. 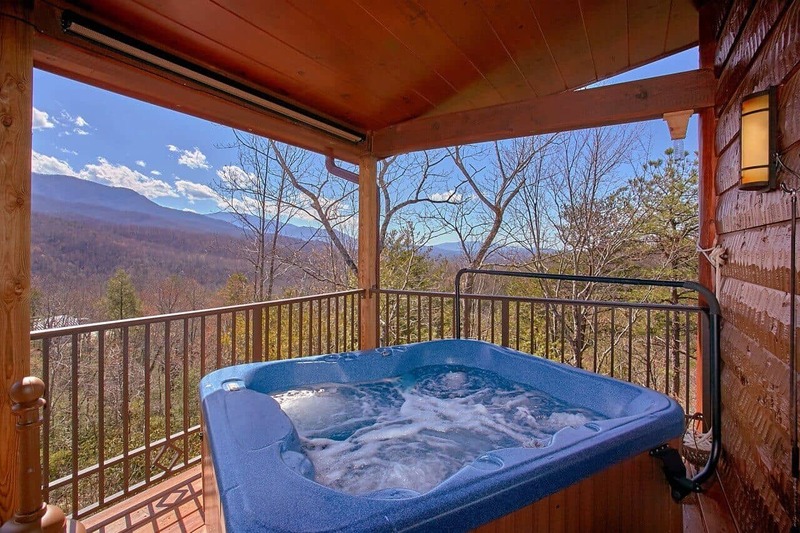 The views were phenomenal and our favorite part was sitting on the porch enjoying the view from the very comfy chairs or hot tub. It is private and away from the busy tourist area which is exactly what we were looking for as we mainly wanted to hike and spend time in the cabin. We wished we could stay forever and will definitely be back! Thank you for your wonderful review, Kelly! We are delighted to hear that your stay was exceptional. We would consider it an honor for you to stay with us again. Please keep in mind, as a returning guest you will enjoy 10% off all future stays. Hurry back, new memories are waiting to be made! Fantastic cabin!! Really spacious, clean, lots to do. They really thought of everything. 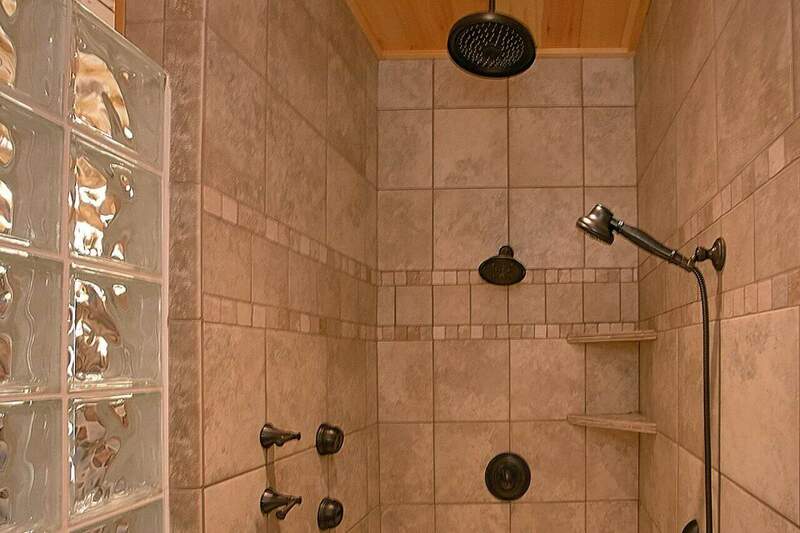 The shower alone is worth the money. 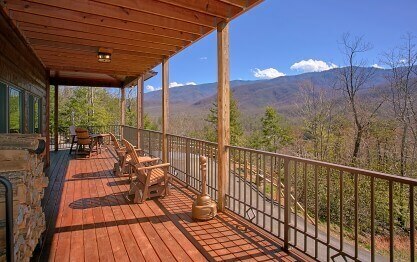 This cabin is really secluded but not that far away from downtown Gatlinburg or the Smokey Mountain Nat'l Park. Thank you for your wonderful review, Michelle. We are pleased that you enjoyed your cabin stay! 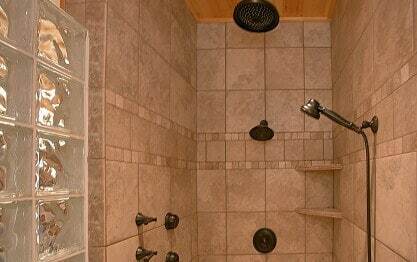 The shower at Livin It Up is certainly relaxing. 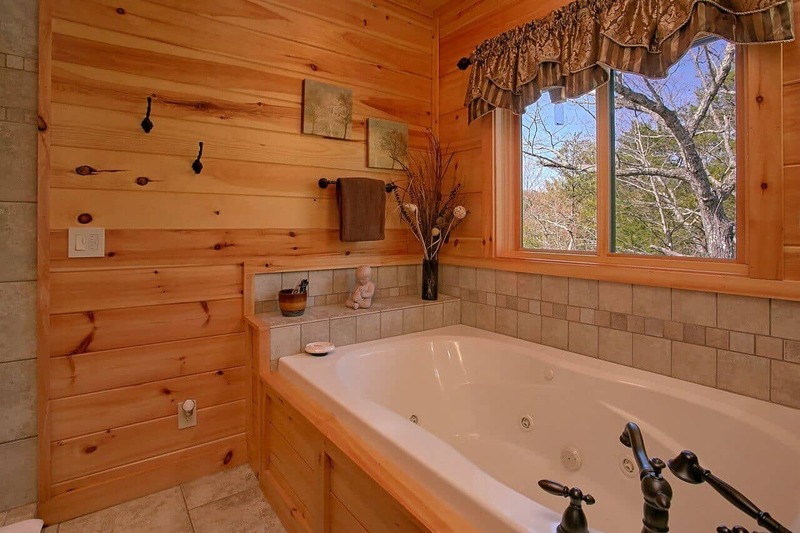 It sounds like you chose the perfect cabin to relax and enjoy a nice getaway. 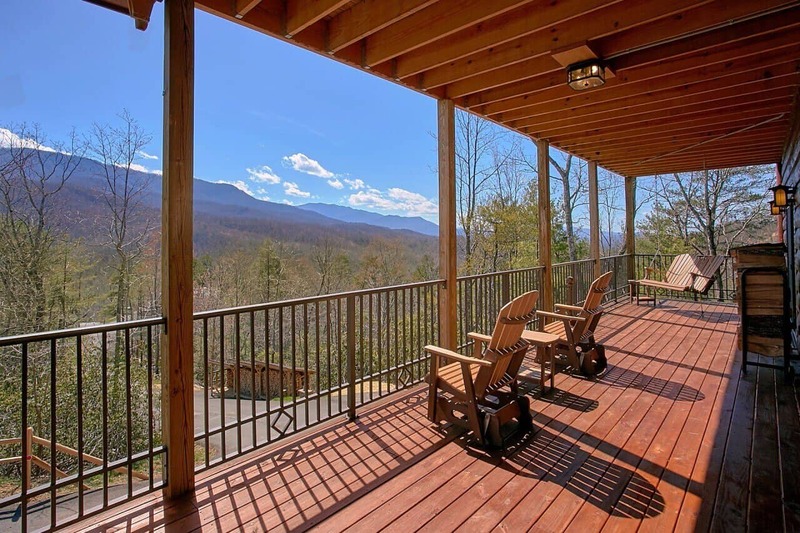 We hope you will visit Elk Springs Resort again when traveling to Gatlinburg! Hurry back, new memories are waiting to be made. The cabin is modern with many upscale amenities and considerably large for just a two person cabin. It was very much worth the extra cost over other two person cabins we looked at online. We also felt… private and secluded even though other cabins were near by. It was just what we needed and I believe we hit a new level in our relationship. Thank you for allowing us to be a part of such a memorable get-away, Stephen. We are delighted to hear you had a wonderful time. We enjoyed having you as our guest and hope you will visit again soon! 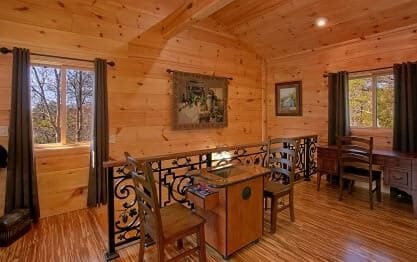 This cabin is so gorgeous, my husband keeps saying he wants it! The view is breathtaking, the pictures don't do it justice. You can't see anyone from any of the pourchs, which are wonderful to sit on …and relax. We actually got to see a huge mama bear and her 4 cubs right outside the door at the cabin! It was so cool, we got lots of pictures of them. I will definitely be coming back and referring everyone who wants to go to Gatlinburg. Thank you for such a great cabin and wonderful experience. We truly appreciate your wonderful review, Coree. We are delighted to hear we exceeded your expectations. You certainly chose the perfect cabin to relax and unwind from the hustle and bustle of everyday life. It truly is a hidden gem! We enjoyed having you as our guest and hope you will visit often. Hurry back, new memories are waiting to be made! "Livin it uo in style"
Beautiful property close to everything needed yet tucked away and very private. Thank you for kind review, John. We are pleased to hear you enjoyed your getaway at Livin' It Up. This cabin is truly a hidden gem! 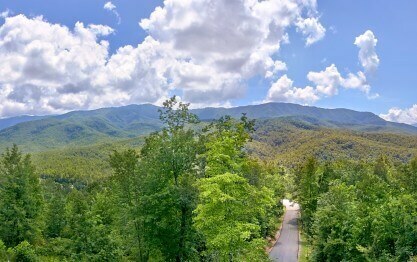 We hope you will join us again during your next visit to The Great Smoky Mountains. We appreciate your wonderful 5 star review, Patty! 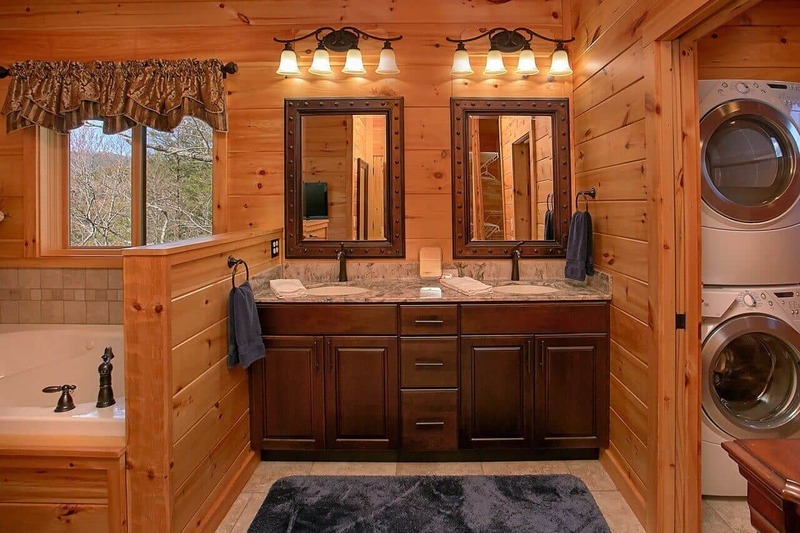 It sounds like you chose the perfect cabin for you and your family. Livin It Up is a great cabin with top-notch amenities and we are so happy that you had such a great time. We enjoyed having you as our guest and hope you will visit often. We appreciate your business and look forward to your return stay with us! Wonderful! Parkway to Cade's Cove, Clime Works zip lines was awesome! Honeymooned in March, returned to Lovin-It-Up in June. Love the cabin, and our relaxing weekend getaway! Thank you very much for your wonderful review, Wesley. So fantastic that you were able to enjoy some of the attractions that Gatlinburg has to offer! We do hope you will continue to visit with us when you travel to Gatlinburg; maybe for an anniversary trip? Keep in mind, as returning guests you will receive 10% off all future bookings. See you soon! "Perfect place to stay - very private!" This was our first get away in 13 years of marriage and we have nothing but good things to say about Livin It Up. Booking was easy and the communication from Elk Springs Resort prior to the trip was …extremely detailed and helpful. I love that they called when the cabin was ready with the code for the front door so we could just go straight to the cabin and open the door. The cabin itself was extremely clean, perfect condition and it smelled like a cabin. The kitchen is huge and has everything you need as far as cooking utensils, pots, pans, etc. We used the outside grill one day too, which was great. The bed was extremely comfortable with lots of pillows and good amount of extra towels in bathrooms. The decks are amazing with beautiful views and very comfortable chairs to sit and enjoy the views. The hot tub was clean and very enjoyable in the evenings. The reason why we chose Livin It Up was because it sits up the hill away from all the other cabins, and it is so private! 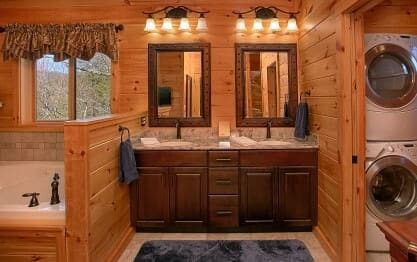 No one can see you and you can not see anyone :) The cabin is about 25 minutes from Gatlinburg, so keep that in mind. We enjoyed beautiful hikes in the area and spend long hours listening to live music in Gatlinburg at night. 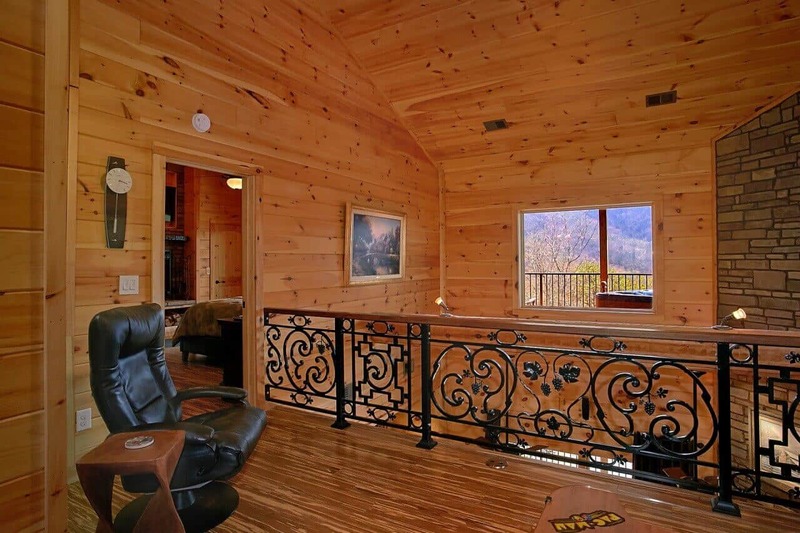 It sounds like everything was absolutely perfect with your cabin getaway experience. Customer satisfaction is very important to us and your 5-star review lets us know we are making the grade. 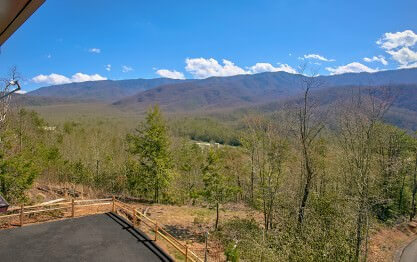 There is so much to see and do in the Great Smoky Mountains. You cannot possibly fit it all in with just one trip. Now that you have had such a wonderful experience, we hope you will be a guest of ours for many years to come. "Amazing house with amazing views!" We had not stayed in this home before although we always use Elk Springs Resort. 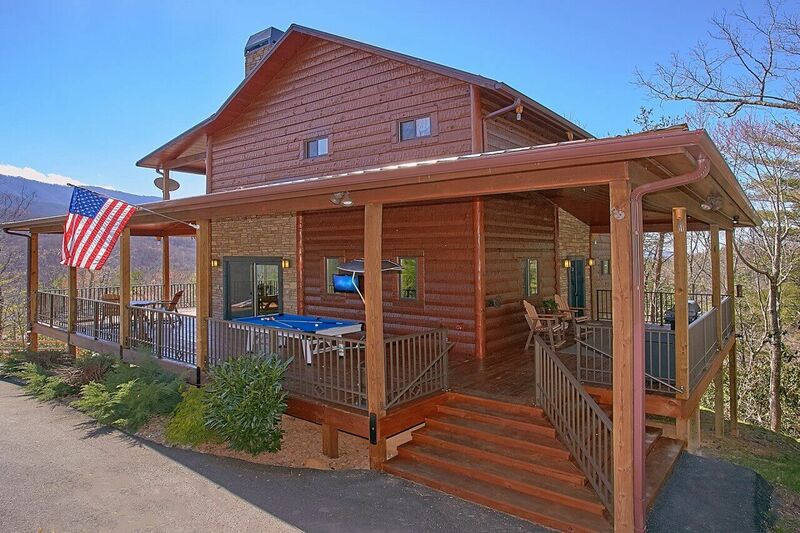 I will gladly come back to this cabin again for the view, the privacy, the shower, the game system, the features and beauty of the home and the price was good! We really enjoyed our stay at Livin It Up our cabin was beautiful, nice, & clean. The view was amazing we will be visiting this cabin again real soon. Thank you for your kind review, Toeniku! We are excited to hear your stay was exceptional. We would consider it an honor for you to stay with us again. Please keep in mind, as a returning guest you will enjoy 10% off all future stays. 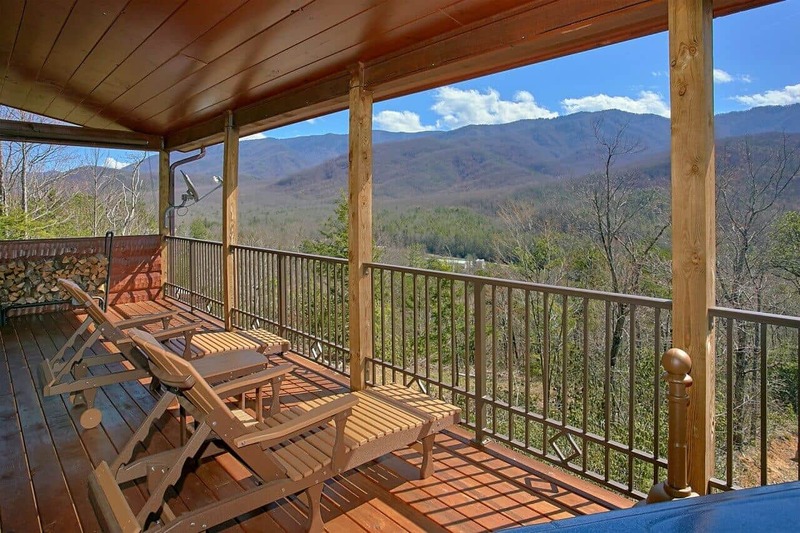 "Great secluded cabin near Gatlinburg "
Excellent cabin for two on a honeymoon. Not cheesy, just perfect. 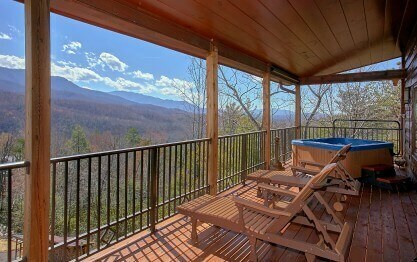 Amazing view of the mountains out the master room and on the porch with the hot tub. Fun surround sound theater with really big TV. …Bring some fire starters for the real wood fireplaces. And, really comfortable bed. Loved this cabin. Thank you for allowing us to be a part of your special celebration, Robert! Congratulations! We are delighted to hear your stay was exceptional. We enjoyed having you as our guest and hope you will consider making Elk Springs Resort part of your anniversary plans for many years to come. Please keep in mind, as a returning guest you will enjoy 10% off all future stays. We stays for an extended weekend in the AMAZING Cabin! The pictures are great, but in person it's breathtaking. The cabin is secluded up on its own drive. Perfect for a relaxing weekend for two. Thank you for allowing us to be a part of such an exciting celebration, Danielle! Congratulations! We are happy to hear Livin It Up exceeded your expectations. We hope you will consider making Elk Springs Resort part of your anniversary plans for many years to come! Excellent! Great communication before, during, and after our stay. The cabin is gorgeous! Will definitely stay again. Thank you, Jonathon! We are pleased to hear we exceeded your expectations. We would consider it an honor for you to come back and stay with us again. Please keep in mind, as a returning guest you will enjoy 10% off all future stays. Hurry back, new memories are waiting to be made! "Livin' It Up is Awesome!" Best cabin with the best view! 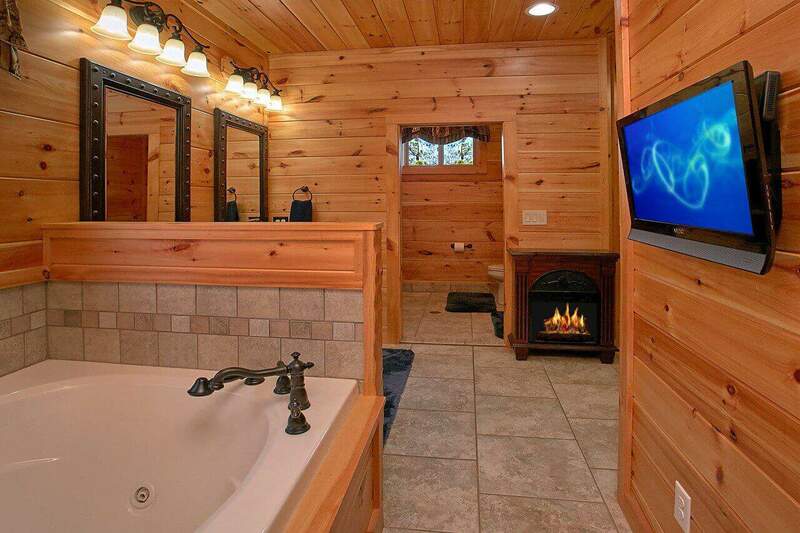 The kitchen, bed, shower, hot tub. Could not ask for anything better! Thank you Joshua for your wonderful review! We are elated that you enjoyed "Livin' It Up". We do hope that you will come back again! Remember, our return guests get a 10% discount on all stays booked in the future. 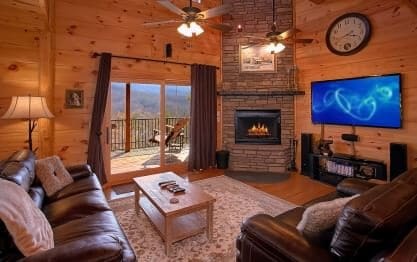 "Livin It Up in the Great Smoky Mountains"
My wife and I rented this cabin for our 20 Year Anniversary and we couldn't have been more pleased. When you are 375 miles away, all you ever have to go on is the description and the pictures on the w…ebsite. The pictures don't do this cabin justice, one of the best places we have stayed to date. The cabin is awesome and very private. It also has beautiful views from almost every room in the cabin. Elk Springs Resort's staff was very professional and also checked on us to make sure that we were enjoying our stay. From the reservation to the check out, the process was great. Thanks Elk Springs Resort for helping make our special occasion great! Thank you for this amazing review! We strive to provide excellent customer service and want all of our guests to completely enjoy their stay. We do hope that you will come back and stay with us again for future special occasions or just to get away! This cabin was beautiful and we enjoyed every minute of our stay. The shower and tub were awesome. The views were so beautiful from the cabin. It was in a great location and easy to find. We are so happy you enjoyed your stay! Thank you for taking time to do this review. We hope that you will plan to visit again. Return guests do receive a 10% discount on all future booked stays! Was amazing. What a beautiful home .Wish it was set up for 4 people just because it is soo big. Loved the wood burning fireplaces. Don't see that anymore. Views were amazing. Didn't want to leave. Who…wever takes care of this property you do an amazing job. The cleanest place we have ever stayed in. We are so happy that you enjoyed your stay! Thank you for your comments. We strive to exceed our guests expectations! Please come and stay again! My husband and I spent our honeymoon here and it was absolutely perfect!!! We would love to come back again and recommend this beautiful cabin to anyone who would love to get away!! We are so happy you joined us for your honeymoon. We are elated that you enjoyed "Livin' It Up" and do hope that your return to stay with us again! Please don't forget to take advantage of our return guest 10% discount on any future bookings. We loved this cabin, we stayed here for four nights for our wedding anniversary and couldn't have asked for better. Very well kept and cozy cabin. You are the last cabin on the hill so it's pretty sec…luded, which we loved! This cabin has everything you could ask for, actually more than you could ask really. It's close enough to Gatlinsburg and the state park to do some playing around, but yet still enjoy the cabin as well. The views are breathtaking. We loved it and will definitely stay again. Happy Belated Anniversary. We are so happy that you enjoyed your stay at Livin' it Up. We do hope that you will come stay with us again! Thank you for your 5-Star review, Dennis! We are delighted to hear your stay was exceptional. We enjoyed having you as our guest and hope you will consider staying with us again during your next visit to Gatlinburg. My wife and I rented this cabin for our honeymoon and it was better than advertised. The cabin itself was high up and away from sight of other cabins which was nice for privacy. Everything inside the …cabin was up to date and high quality. We plan on returning to visit again! Thank you for your review Jordan. Congratulations on your wedding. We are so happy that you enjoyed your stay. Please come back to visit us again.